Here at Lakeland Toyota, we look forward to highlighting the distinct qualities that make the 2019 Toyota Camry – a midsize sedan featured on our showroom floor here in Lakeland – such a special option that warrants close consideration. 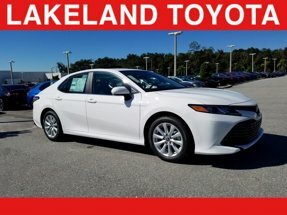 And to put these features, performance specifications, fuel efficiency estimates, interior measurements and technology systems into proper context, we conduct a head-to-head comparison analysis with another popular car in the 2019 Honda Accord for necessary insight to better appreciate how this new Toyota lineup selection excels. When it comes to the midsize sedan segment, the 2019 Toyota Camry showcases an edge in versatility and dependability when directly compared to other marketplace options. From standard Toyota Safety Sense™ P driver-assist support to available V6 engine capability, this new Toyota model proves both dynamic and reassuring for future commuting experiences. And when you factor in the well-equipped cabin, infotainment options, and superior fuel efficiency marks, the well-rounded travel outlook you’re deserving of comes into full focus. Learn more about the 2019 Toyota Camry, compare this sedan to other industry favorites, and discuss available trim levels and options in greater detail by reaching out to connect with our team today. We look forward to answering questions and scheduling a test drive appointment here at our Lakeland dealer location during regular business hours. How do the 2019 Toyota Camry and 2019 Subaru Legacy Compare? Ready to put the 2019 Toyota Camry into necessary perspective for car buying research? A competitive comparison is the best way to achieve that objective, and our team at Lakeland Toyota is happy to provide this information on your behalf. Compare this new Toyota midsize sedan directly with another segment option in the 2019 Subaru Legacy to identify discrepancies in engine output, efficiency considerations, features, cabin volume and much more. From here, you can feel better about a purchase or lease selection you’re set to make. Across the board, the 2019 Toyota Camry dominates its Subaru Legacy competition in capability expectations, interior comfort arrangements, feature assortments, technology appliances and much more. For this reason, we confidently recommend this new Toyota model as a daily commuting option that fits what you’re looking for in a prospective purchase or lease. Ready to assess both the new Toyota Camry and Nissan Altima and come to a judgment on which midsize sedan suits you more? Here at Lakeland Toyota, our team is more than happy to lay out the differences, helping you determine the right fit through competitive comparison insights. Preview the powertrain capacity, fuel efficiency expectations, interior comfort, feature layouts and much more for both vehicles before making this determination and proceeding to next steps in your car buying experience. After sifting through the detailed advantages of the 2019 Toyota Camry over Nissan Altima competition above, it becomes apparent that this new Toyota model stands out over segment alternatives as a well-rounded daily commuter worth a test drive in person. Arrange this behind-the-wheel appointment online today and contact our team to discuss additional features and review questions you may have. For these comparison advantages and more, we recommend the 2019 Toyota Camry over the competition and encourage you to schedule a test drive of this popular new Toyota sedan at our dealership today.